I recently had the flu and I am not sure I would have made it through without a poncho liner, or woobie, that kept me warm while I wasted away on the couch. My wife and I even keep an after-market poncho liner with improved insulation near our bed in the winter to stave off the morning cold that comes with having a wood heated house. It is safe to say that woobies are integrated into my life and I suspect many of you are the same… but what if you could wear one all the time? That is exactly what the Perseverance Survival Woobie Hoodie is all about. It is a hoodie, the world’s most versatile top, that is made from a woobie, the world’s most versatile blanket. You can wear it on its own or use it as an insulation layer under a shell in cold weather. The Woobie Hoodie is available in three colors: Coyote, MARPAT, and good old Woodland Camo. I just ordered a Woodland Camo version for myself from Kit Fox Outfitters and I might do a review on it once I put it through its paces. 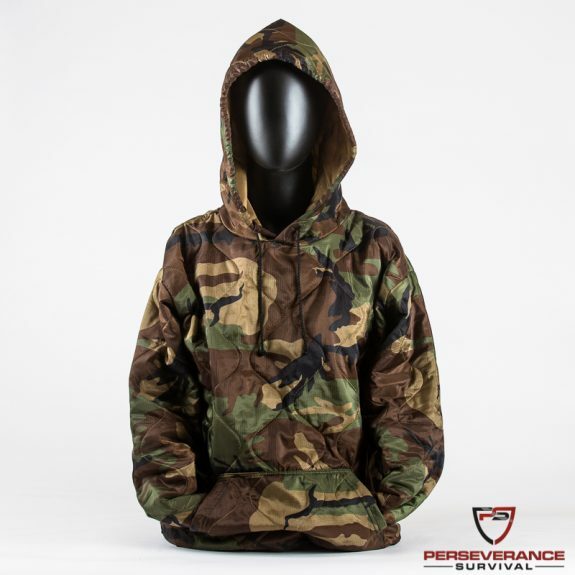 You can check out the Woobie Hoodie at PerseveranceSurvival.com.